Horse owners know this season well since a muddy season is inevitable in many areas of the country. It is worth considering, however, how to best deal with the mud at your horse farm this spring. Check out the following tips from Michigan State University Extension that can help you manage the muddy season at your horse farm. First, making some preparations around the farm before the mud arrives can help to avoid problems. This is one of those situations where an ounce of prevention is worth a pound of cure. Muddy turnouts not only are a mess in the springtime, but the damage caused by horses walking on wet ground can destroy vegetation, making even more work for yourself in the future. There are several steps you can take to minimize this damage. Consider using only one turnout when the ground is muddy to limit the damage to your operation as a whole. You can also fill in any low areas, like those commonly found around gates and entries, to help avoid some of the worst damage. These low areas can be filled with sand, gravel, crushed asphalt or even bark, and filling holes and smoothing ruts can help prevent water from collecting and is easiest to do while the ground is still soft. Feeding can be messy during muddy season, too. This can lead to a lot of waste as hay is ruined by water or mud on the ground. 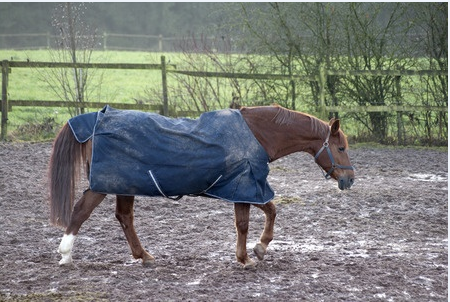 Feeding inside or on a mat can limit waste and also reduce the amount of mud that horses ingest while feeding. Alternating feeding locations, if you are feeding outdoors, can also limit the damage during spring by spreading out traffic more evenly rather than allowing one area to be thoroughly trampled. The muddy season can take a toll on horses, so be sure to watch for any signs of problems. Wet blankets can lead to dermatologic problems and even hypothermia, while ailments like laminitis, colic and thrush can also become more prevalent problems during the wet season. Keeping appropriate clothing and gear on hand can also keep you more comfortable while working around the barn during the muddy season. Wearing insulated muck boots, waterproof gloves and warm clothing that is water-resistant can all help to make spending time at the barn more enjoyable during the spring weather. There is no way to avoid the muddy season for many horse owners, but these steps can at least help you to keep comfortable and minimize the problems this spring. At Deer Creek Structures, we can also help you make your horses more comfortable, too, with our high-quality horse barns and shelters. If you’re looking for a portable horse barn, shed or shelter, give us a call today at 254-546-2276.